After analysing the task for 2 minutes I made some notes. Trends: The graph shows dynamic data, this means that there are changes over time. It is evident that fossil fuels (coal, gas,oil) show the highest consumption with predicted increases, and cleaner energy (wind, hydro, solar, nuclear) have the lowest consumption and will remain relatively low. Grouping the data: Straight away I can see that the best way to group the data would be in these two categories (fossil fuels and cleaner fuels) by grouping the data, you will gain marks for coherence and cohesion. Grammar: I will need to use the past tense / present perfect and language for future predictions. Click here for more detail on grammar and vocabulary for describing trends. 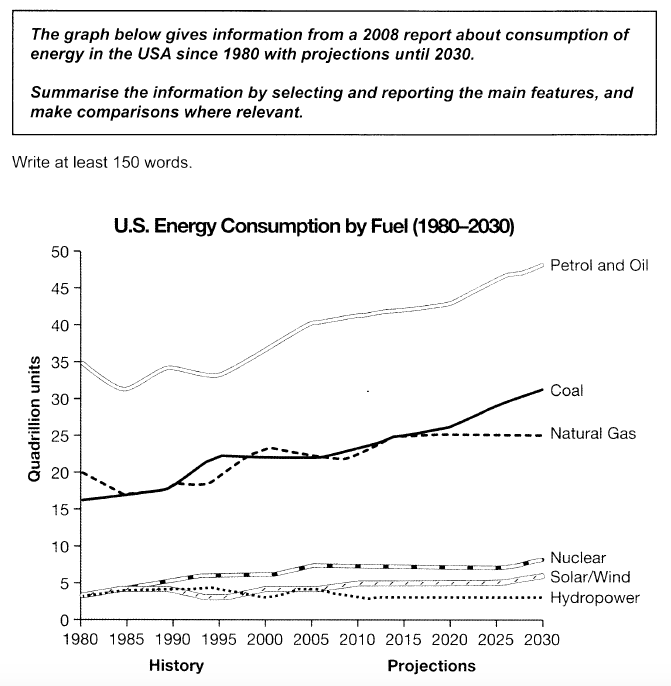 The graph illustrates data from a report in 2008 regarding energy consumption in the USA since 1980 with predictions until 2030. Overall, fossil fuels have shown increases in consumption since the start of the period, with expectations for even more reliance on these fuel sources. Cleaner energy sources have accounted for considerably less consumption with predictions for a similar trend. Fossil fuels such as coal, natural gas, petrol and oil have seen steady increases in energy consumption since 1980. Petrol and oil started at 35 quadrillion units in 1980, then fluctuated until 2000, at which point they climbed steadily with a prediction of over 45 quadrillion units by 2030. Additionally, coal followed a similar rising trend with expectations of around 30 quadrillion units by 2030. Natural gas usage demonstrated fluctuations and it is set to level off at around 24 quadrillion units from 2020 onwards. Regarding cleaner energy fuel sources, they all began the period at under 5 quadrillion units and showed declines in their use, with the exception of nuclear, which climbed slightly to 6 quadrillion units in 2005 with solar/wind expecting to see slight increases. Hydropower is projected to remain relatively unchanged until 2030. The word count is high at 195 words but this is a model answer, remember that you should not report on every single bit of data, you need to be selective and cover the main trends. A word count of around 170 to 190 words would be enough for a well developed answer. You do not get a higher band score for a very long answer, keep it concise and clear. I also advise practicing your writing by using the official IELTS answer sheet which you can download if you click here. Any questions? …. Leave a comment below.